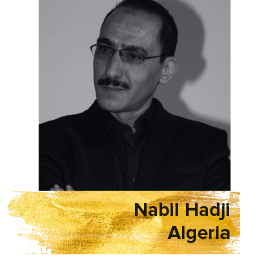 Algerian film critic and journalist Nabil Hadji holds a bachelor's degree in Information Science and Communication Studies from the University of Algiers in 1996, and studied at the La Fémis in Paris in 1999. Many of his critical studies have been published in prominent publications. Hadji was appointed as Artistic Director of the Maghreb Cultural Film Festival in Algeria and Oran Arab Film Festival in Algeria. He has been a jury member at many Arab and international festivals including the Abu Dhabi Film Festival.